Successfully Added Mini Wireless Camera with Receiver (USA) to your Shopping Cart. Mini Wireless Camera with Receiver (USA). This wireless surveillance combo is perfect for keeping your eyes and ears on your home or small business. Looking for an inconspicuous and economical way to watch over your room or small business? Look no further! This's Mini Wireless Camera with Receiver (USA) is simple, affordable, and tiny! Hide it in the corner of a room and watch the action from a distance. Conceal it in your store and catch unsuspecting thieves in the act. Put it in your garage and see who's checking out your car. With a small, easy-to-install camera, a wireless receiver that can be placed 20 meters away, and the ability to link to a TV monitor, the uses of this Mini Wireless Camera are limited only by your imagination. The camera requires only a power source and can be screwed or clipped on walls, floors, or ceilings. 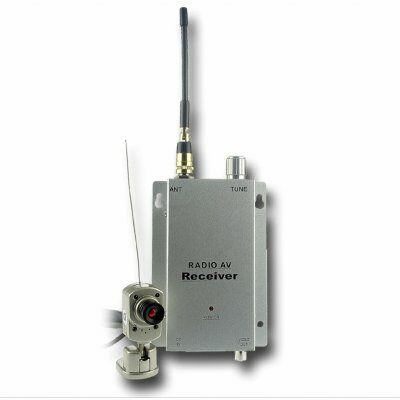 The wireless receiver can be positioned at a distance of up to 20 meters from the cameras and can connect to a TV through AV Out so you can monitor your cameras on a large screen. Tonight, rest easy with the peace of mind that comes with knowing that you have secured your home or small business without endangering your wallet. Tell your friends you got a great deal on your Mini Wireless Camera with Receiver (USA) from the leader in high-quality, low- price electronics: Chinavasion.